Social security is at the center of the economic debate in most of the world. The intense population aging occurring in many advanced countries of Europe and Asia is causing social security finances to be under severe pressure, threatening fiscal sustainability. In Latin America and the Caribbean, the presence of relative young populations has shaped the debate around the type of social security system (with the discussion focusing on the advantages or disadvantages of pure pay-as-you-go, pure capitalization, or a mixed social security systems), rather than on the imminent problems associated with population aging. Cuba, however, constitutes an exception in this regard: while the policy discussions in the island have included elements associated with how to manage and finance social security, the core of the debate appears to be around how to cope with the consequences of population aging. With sustained increases in life expectancy, net negative migration flows, and low birth rates, Cuba’s population has begun to decrease in absolute numbers, while the working-age population is projected to decline during the next 15 years. As a consequence, the share of people 65 years or older is expected to grow to about 1/3 of total population (from less than 1/5 nowadays) by 2050, turning Cuba in one of the 11 countries with the oldest population in the world (United Nations, 2011). Recognizing this problem, the social security reform of 2008–09 increased the legal retirement age for both women and men by 5 years, avoiding what would otherwise had been a 2.9 percent annual increase in the number of social security beneficiaries during 2011–20. The reform also resulted in a significant decrease of the present value of future social security obligations. In spite of the reform, however, current demographic projections still result in increasingly large social security spending, while there will be fewer workers contributing to the system. Concretely, the number of social security beneficiaries is expected to increase by 75 percent during the next 40 years to reach slightly less than 3 million by 2050, an increase of 1.4 percent per year. If long term GDP does not grow to offset the combined increase in the number of beneficiaries and the average pension, social security spending will increase as percentage of real GDP, threatening fiscal sustainability. Alternatively, higher long-term economic growth will result in larger social security contributions and will reduce the net present value of future social security spending flows. Thus, an accurate assessment of factors contributing to long-term growth is essential for evaluating the solvency of entitlement programs, and more generally, the sustainability of fiscal policy (Gordon, 2003). This paper analyzes the interaction between population aging, long-term economic growth, and fiscal sustainability in Cuba. Although the problem of social security in Cuba has been analyzed in the literature (e.g., Mesa-Lago 2008), this paper constitutes a first effort in quantifying the impact of its future imbalances on fiscal sustainability. 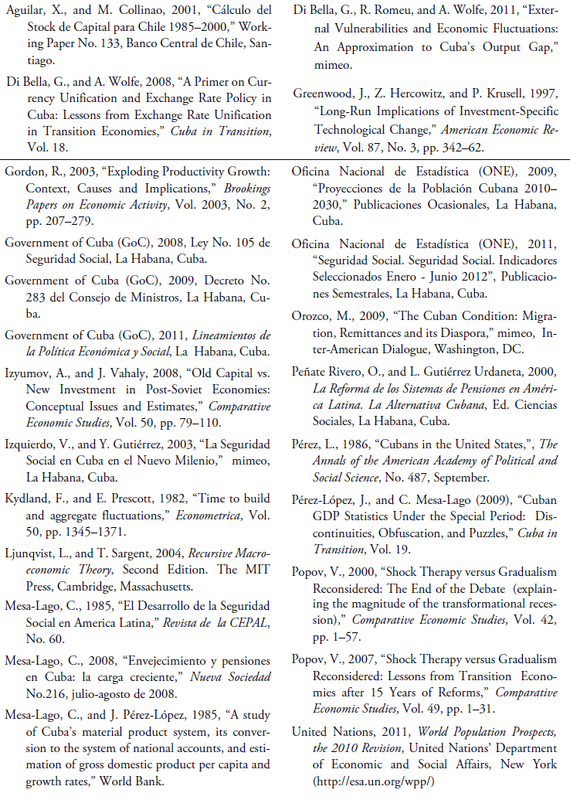 The first section describes Cuban demographic trends and their implications for labor supply and social security spending. The second calibrates a simple general equilibrium model using macroeconomic data for the last 40 years together with population and labor market projections, with a view to assess Cuba’s sources of long-term economic growth and the challenges that population aging brings about. The next section assesses Cuba’s social security spending trends and evaluates long-term fiscal sustainability for a number of scenarios that consider alternative long-term economic growth rates; levels of social security benefits in real terms; levels of foreign transfers; and, tax rates. The results presented in this section allow arguing that the process of economic reforms recently launched (including the recent social security reform), is likely related to the need to increase long-term productivity and output growth, save government resources, and improve long-term fiscal dynamics in the context of an intense population aging, and still large, dependence on foreign transfers. The last section concludes. Together with the lower fecundity rates, the median age of the Cuban population is increasing. It went from less than 25 years in the 1950s to about 40 years by 2010, and it is projected to reach 50 years by 2040. Contributing to this increase, the life expectancy at birth went from less than 60 years in the 1950s, to 78 in 2010. It is projected to reach 81 years by 2030. 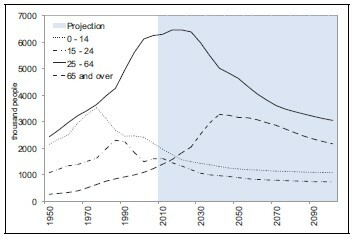 In particular, the life expectancy of those reaching 65 years of age is also increasing, which has a direct bearing on social security expenses.4 Reflecting population aging, the country’s age structure is changing (Figure 1). The number of people 65 years or older are projected to pass from about 1.4 million in 2010 (12 percent of population), to 2.5 million by 2030, and to more than 3 million by 2050 (30 percent of population). This intense population aging would turn Cuba in one of the 11 countries with the oldest populations by 2050, and that with the oldest population in Latin America and the Caribbean (United Nations, 2011). Population aging will also affect labor supply, as the (legal) working-age population is projected to peak sometime during 2020–25.5 In particular, people between 25 and 64 years old are projected to decrease from about 8 million in 2010, to about 7 million in 2030, and further to 5.5 million by 2050. Assuming people continue to retire at legal ages, and barring a further increase in the legal retirement age, the decrease in the working-age population (and thus of the number of people contributing to social security) will occur simultaneously with the increase in social security beneficiaries. Net negative migration rates have contributed both to the increase in the median age of the population and to a lower growth rate of the labor force. United Nations (2011) estimates suggest that net migration rates have been above the world median (among immigrant sending countries) for the most part of the last 50 years, and are projected to remain negative (but decreasing) during the next few decades.6 While migration during the first few years after 1959 included a significant number of elderly people, migrants during the last 20–30 years are mostly of working age (Pérez, 1986; Orozco, 2009). Assessing long-term growth is essential to analyze the sustainability of fiscal accounts, and in particular, of social security entitlements. Economic growth feeds into the value of marginal pension benefits, which together with the number of beneficiaries determine social security spending; the value of tax receipts and contributions that finance social security spending; and the (net) present value of future flows of social security obligations. With that in mind, this section calibrates a general equilibrium model with Cuban macroeconomic and demographic data, in order to assess long-term economic growth; such assessment will be later used to evaluate the sustainability of fiscal and social security policies. This annex describes the data used in this paper, as well as their sources and definitions. Gross Domestic Product (GDP). Growth rates for headline real GDP for the period 1971–1985 correspond to data published by UNDP at 2005 constant prices; growth rates for the period 1986–1996, correspond to data published by ECLAC at 1981 constant prices; data (in levels) for the period 1996 to 2010, correspond to that published by the National Statistical Office (ONE), in 1997 constant prices. The series for 1970–2010 in constant prices was obtained by chaining real growth rates. Headline GDP was first netted out of property income (assumed to be equal to 3 percent of GDP); the change in stocks (which also includes errors and omissions); and, beginning in 2000, the estimated value of Venezuela-related purchases of Cuban services (i.e., non-tourism service exports), that the model treats as foreign transfers. In order to obtain private disposable income the resulting GDP series is multiplied by the calibrated tax rate. Gross Fixed Capital Formation (GFCF), Government Spending and Imports of Goods and Non-Factor Services. Growth rates for the period 1971–1985 correspond to data published by UNDP at 2005 constant prices; growth rates for the period 1986–1996, correspond to data published by ECLAC at 1981 constant prices; data (in levels) for the period 1996 to 2009, correspond that published by the National Statistical Office (ONE), in 1997 constant prices. Data for 2010 is estimated using information from ONE. The series for 1970–2010 in constant prices was assembled by chaining real growth rates. Machinery and Equipment and Investment in Structures. Growth rates for the period 1971–1990 were assumed equal to that for GFCF; growth rates for the period 1990–1996, correspond to data published by ECLAC at 1981 constant prices; data (in levels) for the period 1996 to 2009, corresponds that published by the National Statistical Office (ONE), in 1997 constant prices. Data for 2010 is estimated using information from ONE. The series for 1970–2010 in constant prices was assembled by chaining real growth rates. In particular with respect to Structures, it was assumed that 65 percent of investment corresponds to housing structures, and the rest to non-housing construction. Exports of Goods and Non-Factor Services. Growth rates for the period 1971–1985 correspond to data published by UNDP at 2005 constant prices; growth rates for the period 1986–1996, corresponds to data published by ECLAC at 1981 constant prices; data (in levels) for the period 1996 to 1999, corresponds that published by the National Statistical Office (ONE), in 1997 constant prices. Data for 2000–2010 results from netting out from the data published by ONE, the purchases of non-tourism services by Venezuela, estimated by subtracting exports and tourism receipts (in real terms) from the series of exports of goods and non-factor services. Purchases of non-tourism services by Venezuela are estimated by subtracting from the non-tourism services series, the average non-tourism exports for the period 1990–1999. Labor and Population Statistics. Labor market statistics (hours worked per week, the labor participation rate and the open unemployment rate) were obtained from the National Statistical Office, and from the United Nations. Some data (including the unemployment rate) were estimated through simple econometric analysis, as there were years for which labor market data was unavailable. Historical population data was also obtained from ONE and the United Nations, as well as the years of education of the average worker. The long-term population forecast corresponds to the medium-variant published by the United Nations Population Division and available online. Labor’s share on output. Partial information for the period 1971–1985 corresponds to data published by UNDP at 2005 constant prices; partial information 1985–2010 corresponds to that published by the National Statistical Office (ONE), in 1997 constant prices. Electricity Consumption. Data for electricity consumption is available annually online from 1957 onwards from the National Statistics Office. This data was used to approximate the utilization rate of the capital stock. Exchange Rate System. The available (official) fiscal statistics are compiled in current Cuban pesos (CUPs, the Cuban legal tender); income and expenditures denominated in currencies other than the CUP are converted into CUPs at legal exchange rates. Social security benefits are denominated and paid in CUPs, and spent in the “rationed” system. Goods sold in the rationed system include tradable goods, whose actual (market) prices are higher than the controlled prices for which they are sold. This implies that social security costs at market prices are higher than those reported by official statistics, and from the point of view of the pensioners, that the purchasing power of benefits is higher than their value in current US dollars. Cuba was among the first countries in Latin America to enact social security legislation, together with Argentina, Chile and Uruguay (Izquierdo and Gutiérrez, 2003). Before 1958 there were a large number of autonomous pension schemes that served specific occupations both in the private and public sectors, each of which had its own legislation, administration, financing and benefits (Mesa-Lago, 1985). After 1959, the different pension schemes were unified, and in 1963 the Social Security System was established, under the principle of universal coverage, and “pay as you go” financing (Izquierdo and Gutiérrez, 2003). Social security financing is the responsibility of the state through the budget. Resources come from employers’ contributions and from the state transfers to fill the gap between resources and expenditures. The social security system does not accumulate financial reserves or capital, and its expenses and income are treated as an independent budget within the state’s budget. In 1979 the system was reformed to formally separate the social security system from the social assistance system. In 1994, a new reform aimed at strengthening social security financing (Law 73, “Tax System Law”) opened the possibility for workers to also contribute to the system; and increased employers’ contribution from 12 to 14 percent in the case of firms with foreign capital participation, or privately managed cooperatives. Workers’ contributions (established at 5 percent of gross wages), were only applied to a small number of firms. In 2003, the Social Security Institute was created to improve the management of social security’s resources and provide a better service. Beneficiaries as of 2010 and their life expectancy. The number of beneficiaries per type of benefit corresponds to those reported in ONE (2011); the age composition of beneficiaries is assumed to correspond to that of the general population, as reported by ONE (2009). Their life expectancy is line with that in United Nations (2011). New beneficiaries each year (in gross terms) from 2011 onwards. Beyond the transition period (which ends in 2020), they are calculated as the sum of the annual net increase of men 65 years and older, and of women 60 years and older; annual cohorts of women and men through 2100 are interpolated from United Nations (2011), from original projections in 5–year cohorts. The number of social security beneficiaries (including regular pensioners and those receiving survivors’ benefits) as percentage of people of legal retirement age is assumed to evolve with labor participation rates lagged 40 years. Disability beneficiaries are assumed to remain constant as a proportion of the working-age population for 2010, as reported by ONE (2009, and 2011). The forecast for the working-age population from 2010 onwards is that in United Nations (2011). Compensation for the existing beneficiaries. It is assumed to be equal to the average benefit in real terms existing in 2010, per type of benefit. To obtain benefits in 1997 Cuban pesos, the benefits in nominal terms as reported in ONE (2011), are deflated by the GDP deflator. Marginal compensation for new beneficiaries beginning in 2011. They are calculated as the average of the best 5 years of per capita GDP out of the last 15 years, as required by law (GoC, 2008, and 2009). The resulting average is multiplied by the ratio between the marginal benefit in real terms calculated from information in ONE (2011) and per capita GDP in 2010 (about 40 percent). Survivors’ benefits and disability benefits are calculated from pensions, by keeping the ratios of the former and latter with respect to pensions observed as of 2010 (all in real terms), calculated from information in ONE (2011). Social Security Expenditure. The forecast for each type of benefit is calculated as the sum of the product of existing beneficiaries and their respective annual compensation. The forecast for aggregate social security expenditures is the sum of the expenditures for each type of benefit. As benefits depend on the long-term GDP growth rate, social security expenditures (both in levels, and as percentage of GDP), will vary together with long-term GDP growth. 1. The views in this paper are those of the authors and do not represent the views of IMF’s Management or its Executive Board. The corresponding author is Gabriel Di Bella (gdibella@imf.org). We thank Marcello Estevao for comments on an earlier draft and participants at the 2012 ASCE Annual Conference, including Sergio Díaz-Briquets, Jorge Domínguez and Silvia Pedraza for comments and suggestions. The usual disclaimer applies. 3. Population aged between zero and 14 years old, peaked at 3.5 million in the mid-1970s, decreased to about 2 million by 2010, and is projected to continue decreasing before stabilizing at about 1.1 million by the end of the century. 4. See Peñate and Gutiérrez (2000), and United Nations (2011). 5. The (legal) working-age population would have peaked before 2020, if not for the increase in the legal retirement age by 5 years for both men and women approved in 2008. Working-age population includes people aged 15–64 years. 6. United Nations (2011) projects that net negative migration in Cuba will slowly decrease in the coming decades, similar to what is assumed for Puerto Rico. Net negative migration flows for Jamaica and the Dominican Republic are projected to be negative for a longer period. 7. The dependency ratio expresses inactive population as percent of working population. According to ONE (2009), it will increase swiftly beginning in 2020. 8. Taxes are understood to be net of domestic transfers, and to include all forms used by the government to extract resources from productive activities to finance public spending. Although the model is non-monetary, taxation is meant to capture, e.g., the real transfers from the “inflation tax.” The two-planner model is based on a model by R. Manuelli (Chapter 14, Ljunqvist and Sargent, 2004). 9. It is assumed 16 hours per day are non-sleeping. 10. This transformation is similar to that in Greenwood, Hercowitz, and Krusell (1997). 13. Much of the external debt contracted by Cuba previously to 1990 was never repaid, including debt with the former Soviet Union, former CMEA members, and other official bilateral debt. 14. The growth rate in the years of education of the average worker during 1970–2010 is higher than those observed in, for instance, Canada, Chile or Costa Rica. However, among tertiary/university graduates, there is a predominance of non-technical degrees. This suggests that γH = 1.008 might represent a higher bound. 15. Disability benefits and survivors’ benefits were about 90 percent and 85 percent of age-related pensions, respectively. Social Security expenses as percent of real GDP were larger in the mid-1990s than that at the beginning of that decade, as GDP decreased faster than social security spending during the “special period”. The average monthly pension in 2010 was 248 Cuban pesos (183 Cuban pesos at 1997 prices), or about US$10 at “unofficial but legal” exchange rates. Pensions are mostly spent in the “rationed” system at below market prices. The marginal pension granted in 2010, at 1997 prices, was 223 Cuban pesos, what appeared to be lower than that established by law. 16. Social security benefits’ projections are expressed in 1997 Cuban pesos. See Annex II. 17. The cumulative fiscal disequilibrium is calculated as the sum of fiscal imbalances year after year. As pointed out above the solvency problem would be worse if financing would occur with interest-bearing debt. For instance, if γγ = 1.009 and the real interest rate on debt was 1 percent, the cumulated cost through 2050 would be 30 percentage points of GDP; if the real interest rate was instead 2 percent, the cost would climb to more than 60 percent of GDP. Debt service charges could potentially create liquidity problems in addition to the solvency problem highlighted. 18. As social security benefits are denominated in legal domestic currency, a devaluation of the Cuban peso (and the resulting inflation) would also result in a decrease in the real value of benefits in real terms. 19. The model only allows analyzing the effect of increases in income taxes. Future research could explore using a more refined model that allows for consumption taxes, and for the incorporation of leisure in the utility function. 20. Given the dual exchange rate, dual currency system currently applied in Cuba, unsustainable domestic financing results in hard currency rationing, and potentially in exchange rate devaluations (of either domestic currency against reserve currencies, and of the exchange rate between both domestic currencies (the CUP and the Convertible Cuba Peso, CUC). The elimination of the dual currency system will be challenging in the presence of unsustainable fiscal dynamics. 21. A transitory regime through 2015 was established for the workers that turn 60 (men) or 55 (women), during the first 7 years after the approval of law (GoC 2008, 2009). 22. In case of 1 dependent, the benefits are set at 70 percent of the original pension; in the case of two dependents, the benefits are set at 85 percent of the original pension; and for 3 or more dependents, the benefits are set to be equivalent to the original pension. 23. Monetary pensions are classified into ordinary and extraordinary pensions. Ordinary are those granted for jobs not associated with any specific risks; extraordinary are granted for risky jobs. Monetary pensions are further divided between short and long-term; short-term are those granted only temporarily, for instance those granted to mothers right before and after giving birth (for a total of 18 months). Since 1986, short-term pensions are responsibility of the entities in which workers labor. There are special pension regimes for independent workers, the members of the armed forces, the employees of the ministry of interior, members of independent agricultural cooperatives and artists.